So there it is you decided to live your dream? Phuket and its beaches is your destination; your new life is at your doorstep. Tickets are reserved, visas are stamped, you’re almost there yet but now here is the question: Where to stay in Phuket? We kindly wrote this guide to help you to find your dream property and ideal location. 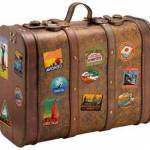 Which location for holidays or long term rental? Phuket may seem small, yet if you choose the wrong area it could be very restrictive especially if you need to work or have kids to bring to school. It can take an hour and a half to go from North to South and that’s not counting the traffic. No problem for you, any place on the island could do. Though you’d better choose a place not too isolated and close to amenities. If you have health problems it is better to settle down around Kathu and Phuket Town, international hospitals like Bangkok Hospital are nearby. You’re thirst for outings and entertainment: Patong Beach, Kata Beach and Phuket Town are appropriated. This being said Kathu with its many activities and its central position provides access to all parts of the island within a reasonable time. This is why we chose to set Abyss Phuket offices is this area. 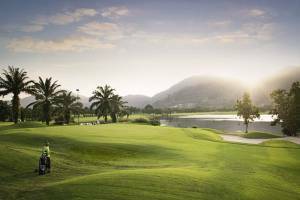 There are golf courses, a wake park, karting, shooting range, enough to keep you busy all year round. Patong Beach is only 15 minutes away so it’s pretty convenient. It depends on your children’s school and your job. In all cases the areas mentioned above are rather quiet and away from revelers. That said Surin, Bangtao and Rawai have great trendy bars. Some will note that we didn’t mention Cape Panwa, the North East and North West. We just think these are areas for inactive or vacationers, so not suitable for families. -In The Center: Kathu, Boat Lagoon, Koh Kaew, Kamala Beach and possibly around Phuket Town, Recommended schools are KIS, BIS and Headstart. Patong Beach is popular for its world renowned nightlife, shopping center and its tourists galore. It’s really convenient to settle down in this area as you’ll be in middle West coast. 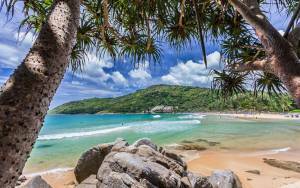 It’s the busiest part of Phuket and also the best puck if you’re looking for beautiful beaches. Though you must consider that it gets crowded in high season. On Patong hill however you can get the best of both worlds: the relaxing nature and at its feet the vibrant city.Kalim beach is a part of Patong bay that we would recommend as it’s close to the center but far enough to be in a quiet environment. Many retired persons chose Patong as they can enjoy being surrounded by different nationalities, feel the world’s vibe. They also find everything they need at their doorstep, no need to drive or ride. Kathu is the name of a district but also the name of a city. It’s right in the middle of the island between Patong beach and Phuket Town, it’s the island’s CBD. 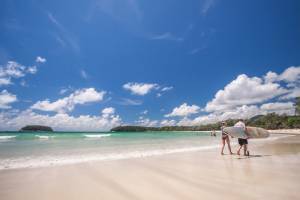 Not only its convenient for retired people,families and expats with all the schools, shopping centers (Central Festival) and international hospitals but you’ll be close 15 to 30 min to most of the best Phuket beaches. It could do for holidaymakers familiar with the island who can drive a car or ride a motorbike. Prices of real estate are cheaper than on the coast but it tend to rise with its fast development. It’s a good opportunity for investors to buy in this area. It’s also really popular for its numerous golf range like Loch Palm, Country Club and Red Mountain Golf club. Kata Beach is situated on the west coast like Patong, they both share the massive influx of tourists in high season. Though the population there is a little different and the beach more tropical and spectacular. From there you’ll shortly reach the south of the island with beautiful beaches like Kata Noi, Nai Harn and Hat Nui. Chalong Pier and Rawai are not far away either (15 minutes) and offers many excellent seafood restaurants. We highly recommend it to holiday makers. Between Patong and Surin Beach you’ll find Kamala Beach, it’s popular for its beautiful beach, its multi-million dollars luxury villas and its village ambiance. There you’ll find cheaper prices than in the locations previously mentioned. There is a large community of expats which opened restaurants and bars in case your home sick you can probably find food from home or people speaking your language. It’s conveniently located as you’ll be 5 min to Surin, 10 min from Patong and only 30 min from Phuket airport. Good for families, expats and holidaymakers. 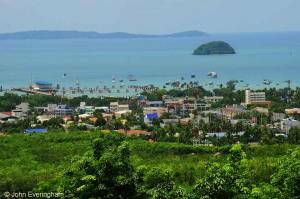 Rawai and Nai Harn are expats and holiday makers friendly with it’s relax atmosphere. It as all your looking for: beachfront bars and thai and western restaurants, shopping center, nightlife and a pier to buy fresh seafood. Many expats choose to drop their luggage in this slow motion lifestyle part of Phuket. 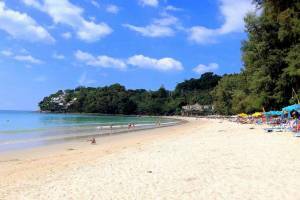 Nai Harn is part of Rawai and greats your eyes with one of the most beautiful Thailand’s Beach. The real estate there is mostly villas but more and more condominiums are built so now its has a fairly good apartments offer. Chosen by many for being close to the South beaches: Kata, Rawai, Nai Harn and the central hub: Phuket Town and Kathu. It’s a great choice for expats but we wouldn’t recommend it to holidays makers if you don’t want to ride/drive. If you’re a scuba diver it could make sense as Chalong Pier is the departure point to the best dives spots: Racha islands and Koh Phi Phi. 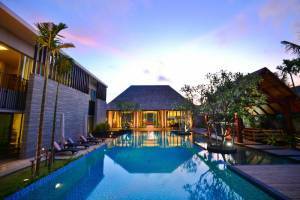 Real estate prices are the lowest with Phuket Town and the offer is pretty wide. It’s a fairly large city, more “Thai” than Patong or Kata. There remains the island’s history and a strong Chinese influence. There are numerous restaurants, trendy bars, shops galore but also traffic and population. 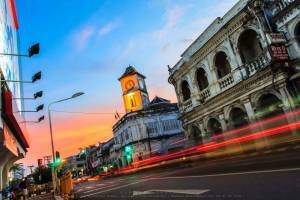 I suggest Phuket town for the most citizens of you, having said that the beach is never far away and it is still far smaller than Paris or London. In terms of prices it’s one of the cheapest area as locals are the main residents. Everything of course depends on what you are looking at but there are obviously more expensive areas than others. The trendiest and therefore the most expensive: Patong, Rawai, Nai Harn, Kata, Boat Lagoon, Laguna, Bang Tao and Surin. A long term rental in a studio or a one-bedroom condo offers variable services and amenities depending on the condominium. It’s the cheapest solution. Rates start at 400 USD/15 000 THB and go up to 2 000 USD/70 000 THB per month. Condominiums or condos are building composed of apartments coming with swimming pool, surveillance camera, lifts and very often a gym and parking. It provides services like security 24/24, reception and sometimes restaurant and laundry. Obviously you’re paying for those benefits but with Western stringent safety standards imposed to condominiums it’s reassuring and a guarantee of quality. A studio or apartment from 35 to 50 m² costs about 500 USD/20 000 THB to 1 000 USD/40 000 THB per month. Regarding prices there are huge disparities, a 3-bedroom seafront villa in Kata will be much more expensive than a villa in Kathu inland. A private pool villa starts at $ 1,200, an oceanfront villa in Patong will cost $ 12,000 per month. You can also find houses for $ 800 a month, location has a big impact on the rates. It is necessary to get an agreement with us and with the owner to clarify the terms and conditions of your rental in Phuket. 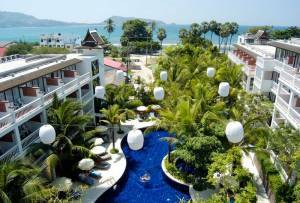 You can get short term contracts for a holiday rental or you can get a long term rental if you want to settle down in Phuket. Most owners will require a security deposit (bond). It’s variable for short stays but for long term it’s common to pay a 2 months deposit. If you have any questions, feel free to contact us. You can also use filters to ease your search with the advanced search.